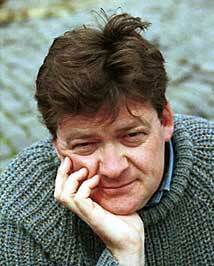 John Burnside was born in 1955, and now lives in Fife. There is a marked divergence in theme and tone between his poetry and his prose work. He allows poetry sequences to emerge organically in his imagination, without much conscious intervention. 'The Hoop' (1988) was followed by 'Common Knowledge' (1991), 'Feast Days' (1992, winner of the Geoffrey Faber Memorial Prize), 'The Myth of the Twin' (1994), 'Swimming in the Flood' (1995), 'A Normal Skin' (1999), and 'The Asylum Dance' (2000). Elvis Presley, an iconic figure to the young John Burnside, gives his name to the title of the short story collection 'Burning Elvis' (2000). His novels, in contrast to his poetry, are the result of a controlled process and they are altogether darker. 'The Dumb House' (1997) is a sinister tale of children being used in a crazy experiment on language. Questions concerning the nature of masculinity have inspired 'The Mercy Boys' (1999), centring on the hard-drinking Scottish male, and 'The Locust Room' (2001), an unnerving but ultimately tender take on male sexuality. 'The Asylum Dance' won the 2001 Whitbread Poetry Award.